The Civil War meant loss for Faith Lindberg. 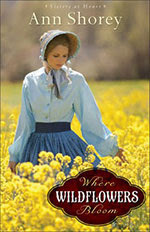 With her father, brother, and Royal Baxter, the man she wanted to marry, taken from her, she yearns to travel west to Oregon and start a new life. Noble Springs, Missouri holds nothing but sorrowful memories. The only thing stopping her plans is her grandfather. He's loathe to sell the family mercantile and leave the only home he's ever known. When Royal Baxter shows up alive and well, she's overjoyed. He woos her with promises of moving west, but her grandfather is less than enthusiastic. This was my first sampling of Ann Shorey's work, and I enjoyed it very much. She had me a nervous wreck by the end of the book, wondering what course Faith would take. Question for Writers: Do you keep your readers biting their nails through the whole manuscript or give them a reprieve every now and then? Let's hear your thoughts. Question for Readers: What kind of books do you prefer: those that keep your heart pumping faster than a high-speed train or something a little more relaxing? Why? This sounds like a lovely read, Susan--thanks for the review. I like adventure and a few heart throbs, but mostly I need to relax when I read, so I prefer books that don't put my on a roller coaster! I like a combo of both when I read. I actually have this book on my TBR list. I look forward to the read. I like a little of both--I need a break from the heart pumping ones and like to just sink into slower pace awhile. Hi Dorothy - Good point. When Beloved was ill, the last thing I wanted to read was a medical novel! Hi Jess - I do like the excitement and tension of a well-written story. Hi Jen - Yes, when life is full of roller coaster moments, it's nice to slow it down with a relaxing read. Hi Loree - Oh, I think you'll enjoy it a lot! Hi Ann - Yes, you did a good job with the tension. Thanks so much for stopping by and commenting. Thanks for stopping by and commenting. Have a nice weekend!